Contact Yard Art Levin now! Many of our ornaments are not just garden ornaments, but designs with attitude. Our range includes maodern & traditional, bird baths, contemporary garden art, world art, water features, animals, pots & planters, wall plaques and traditional/classic statues. We also make a range of tree rings, garden edging & pavers. A lot of our ornaments are exclusive to us in the Lower North Island and cannot be purchased elsewhere. We take pride in working with our customers to create a feature for the home or garden, not only by matching a clients colour scheme, but also by mixing and matching our products to produce a stunning feature. 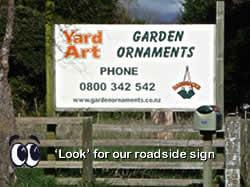 Visit our website (www.gardenornaments.co.nz) to view our extensive range of over 700 products.